Renée Zellweger plastic surgery: In Hollywood, women over 40 get a new face or disappear. Renée Zellweger, earlier this week. When Jerry Maguire hit theaters in December of 1996, 27-year-old Renée Zellweger was tagged as Hollywood’s new “It Girl.” By January, Toronto Star lifestyle reporter Judy Gerstel was praising the actress’ staying power: “In a business that regards lovely young things as a raw, renewable resource—witness Alicia Silverstone and Liv Tyler of recent memory—Zellweger is here to stay.” But by March, Gerstel had replaced Zellweger with another young blonde: Hope Davis, she wrote, was “This year’s Renée Zellweger.” Wasn’t Renée Zellweger supposed to be that year’s Renée Zellweger? “It Girl” is both a welcome and a warning shot. Actresses who receive the label are said to possess an ineffable quality that defies the vocabulary of even the most competent critics. Gerstel pegged Zellweger as a “beguiling concoction of wholesomeness, ingenuousness, vulnerability and sensuality.” And in her review of Jerry Maguire, New York Times critic Janet Maslin praised Zellweger’s “open, eager, unconventionally pretty face,” and noted that her “fetching ordinariness” was somehow “quite extraordinary.” The word these writers were searching for was young. When the now-45-year-old Zellweger appeared at Elle’s Women in Hollywood awards Monday night, she earned a new set of mysterious qualifiers: “utterly unrecognizable,” “drastically different,” and “suspiciously puffy,” the Daily Mail said. Zellweger’s transformation was so alarmingly obvious that Gawker covered the event by simply publishing a gallery of Zellweger shots, each accompanied by the incredulous caption, “Here’s a picture of Renée Zellweger,” no other commentary needed. Surgeons who have not treated the actress are comfortable getting more specific while hawking their wares: Zellweger, they say, is now a beguiling concoction of “blepharoplasty,” “Botox,” and “fillers around her nasolabial folds.” One plastic surgeon told the Mirror that the procedures had “opened up her eyes and face dramatically.” Zellweger’s face is again open, but now it’s too eager. 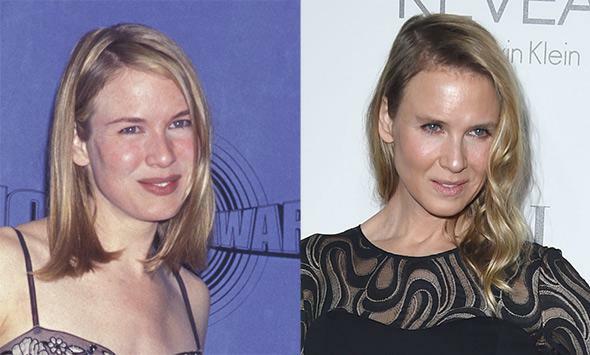 Renée Zellweger in 1997, left, and on October 20, 2014 in Beverly Hills, California. Plastic surgery is upsetting to watch. The tautness of Botox and the bloat of injectables provide visual proof that actresses are more valuable for their youth than their humanity. Stars rework their faces until they are neither pretty nor unconventional, at which point they are discarded. The alternative—where former female stars age direct to DVD, then quietly retreat from IMDB—is easier for us to stomach, as there’s nothing to see. But when fallen It Girls like Zellweger re-emerge in middle age with radically retooled faces, we can’t look away. It only took a few years for Zellweger’s “unconventionally pretty face” to be recast in the public imagination as just plain ugly. And let’s be clear: Zellweger would not have been praised for “aging gracefully” had she showed up Monday night un-nipped. In Hollywood, “aging gracefully” is a euphemism for “good plastic surgery,” the kind that successfully skirts an unarticulated line between sagging and frozen. (See: Sandra Bullock.) Character actresses like Melissa Leo can grow into great careers later in life, playing hard, complicated broads, but our baby-faced ingénues are specifically prized for their youth; it’s nearly impossible for them to “get better” with age. (See also: Meg Ryan.) Zellweger’s last critical hit came out in 2005. Hollywood discarded her a long time ago. So now, she’s returned looking nothing like the old Renée Zellweger—you know, the actress nobody wanted to look at anymore. Can you blame her? When 81-year-old Kim Novak took the stage at this year’s Academy Awards, viewers harassed her for the plastic surgery that had turned her once-beautiful face into a poorly constructed mask. To hammer home the point, commentators compared photographs of Novak in 2014 to glamour shots she took in the 1950s. They did not, of course, compare her to the faces of other “normal” 81-year-old women. You don’t see many of those onscreen. Plastic surgery is fake. So is the Hollywood fantasy where women over 40 just don’t exist.